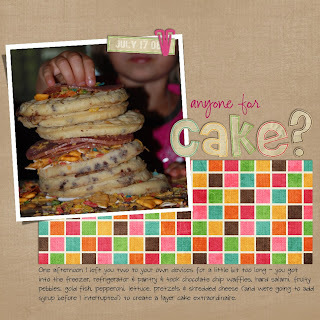 My Scrappin' Evolution: Cake Anyone? I knew I had to scrap this picture when I took it, and I came to my computer with ideas of clusters & swirls and just more stuff on the page. I browsed through some galleries for inspiration and nothing. So I just laid some stuff out on the page and simple just seemed right. I modified the alpha a bit by changing the color the stroke inside the letter from it's original white to a color from the patterned paper. Simple is perfect for this photo. It speaks for itself. Love the bright colors. Just too cute. i'm with heidi!! simple works perfectly with this LO!! the colors are you used are awesome!!! i just love it!